Explore New York City with our popular FreeStyle New York Pass! With prebooked tickets you get the chance to experience the best of New York in 72 hours! The package includes a 72 hour unlimited All Loops Hop-On Hop-Off Bus Pass as well as a choice of either three or five optional attractions. 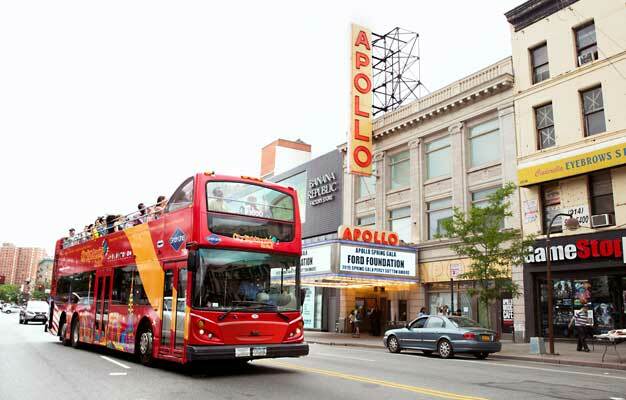 The FreeStyle New York Pass includes a Hop-On Hop-Off off bus pass which gives you access to all the bus routes with over 50 stops for 72 hours and your choice of three or five popular attractions. Shortly after your booking is complete, you will receive an e-ticket by email. Please print out your ticket and bring it with you to the Gray Line CitySightseeing New York Visitor Center. When you arrive in New York you need to redeem your e-ticket at the Gray Line CitySightseeing New York Visitor Center before you can start your sightseeing. Where do the buses start and stop? You can see a map of all of the loops here and the complete list of all stops Here. Your tickets are valid to start one month from the 'Valid from' date you choose when you book your tickets. Your Hop-On Hop-Off bus tickets are valid for 72 hours from the moment you pick them up at Gray Line Visitor Center. Your tickets for your chosen attractions can be used at any time during your stay. - The choice of attractions is subject to change without notice. - Please allow at least 2-4 hours if visiting the Statue of Liberty and Ellis Island during high season. Are there child rates available? Yes, children's tickets are available for children between ages 3 to 11. Children under age 3 are free when accompanied by a paying adult.